It seems fitting to read the story of a female boxer at a time when it seems like women are once again trying to negotiate their path in society and fighting for equalities we thought had been sorted long ago. Of course, in Anna Freeman's The Fair Fight, the fighting the women have to do is, in many cases, physical, and leaves very visible scars. Growing up in her mother's brothel, Ruth escapes life as a prostitute by instead becoming a prize fighter, under the patronage of the cold Granville. Meanwhile, Perry finds himself the head of his privileged family after a series of unthinkable tragedies, while his sister Charlotte battles her way out of numbness and into life. And Perry's friend George, hapless and always on the wrong side, tries to make his fortune and rise to the top. The Fair Fight is told through the eyes of Ruth, Charlotte and George, three people who initially could not be more different, but who are brought together through circumstance and end up having a lot in common. Freeman creates powerful, sympathetic characters, whose pain you feel even when they bring it upon themselves. Ruth's physical prowess is mirrored, eventually, in Charlotte's mental strength, while George ultimately and unfortunately proves to be the weakest of the three. While you can feel almost every punch Ruth throws and receives (showing Freeman's great skill with words), it's Charlotte who I loved the most, and who I rooted for throughout. A victim of society, illness and her own family, she had the furthest to go of the two female protagonists, and the furthest to fall. Watching her grow over the course of the book was thrilling, nervewracking, and definitely rewarding. 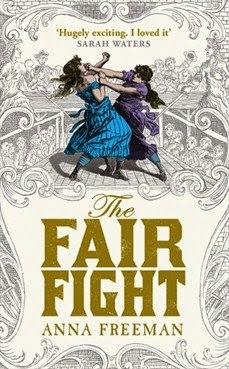 The Fair Fight is Freeman's debut novel, but you would never guess by how accomplished the writing is. You're thrust into the world of Bristol in the late 18th century from the opening page, with its unfamiliar language - pug, cullies, the fancy. Freeman doesn't stop to explain any of the terms, trusting that her reader will guess at the correct meaning, and she's right. It doesn't take long to figure out the meaning of certain terms, and it takes even less time to love the language and setting and be swept up in the world of the book. Freeman's book stands out for being just a great story, but also because it's historical fiction for a modern audience, because it's well written and engaging, and because the world it creates lives around you while you're reading. •The Fair Fight is release in the UK on August 28, 2014.